After much delay and some serious navel gazing, I am pleased to present the grand final tally of winners. These are a series of winners picked out by me for special attention. With so many awesome entries it was not always possible to award a prize to all the posts that deserved it. This is my last opportunity to make up for that and dish up some more prizes. This is a section that I have been thinking about since week one. There are so many entries that I wished I could award a prize but, for one reason or another, I did not. Of all the competition participants there was one who got the short end of the stick. Of all the competition participants there was one who got the short end of the stick. As a member of our board of trustees, this entrant was often tied for the first place and to avoid any appearance of favouritism I let slip back to second place. She was the only writer to only win one prize. Even so, she never once made a fuss and was a good sport about it. Thus I want to honour Laura with this special editor’s pick prize both of being a good sport and for writing a post that should have taken a prize. Why do I write in my genre, by L. L.. Winder is a fantastic reflection on the drive to write and why we write what we write. As I said in the “best post” section of the winner’s post for that week, every single post was a contender. Laura’s just happens to be the one I singled out for some overdue praise. That made me actually laugh out loud. Imaginary high-five my friend, imaginary high-five. There is one post that sticks in my memory, even now. It took the subject of time travel (one of my all-time favourite topics) and made it into one of the most emotionally memorable short stories I have read in a while. Stories from the edge had this post: If I had a time machine. I swear you’d wish it as hard as the character does. After the deadline: A post made after the deadline but before the grand finish. This prize is for getting things finished even when the main thrust of the competition was already past. It is awarded to encourage that dedication to writing where better late than never is the rule of the day. A rule I live by. This prize goes to L. L. Winder (BraidySpice) for her reflection on Plotting vs Pantsing. Most folks were content to set up on a free platform like WordPress or Blogger. But one entrant set up a custom WordPress on a custom domain name. Despite having never done anything like that before and after a few false starts, Ben J deserves some serious love and respect for not only sticking with it tot he end but doing so on a brand new and unfamiliar platform. Not only is this likely to become the most useful of all foundations for an author platform, it contains some really good writing. For example, with no bias at all, this post on what he loves most about Thanet Creative Writers. Like many of his posts, Ben has found the most interesting ways to subvert the prompt. The Kentish Rambler carried right on blogging (as did some of you others). The Kentish rambler caught my eye for simply having the most amazing and pretty pictures. Pretty pictures count for a lot. Take a look at April Ramblings. The initial plan for the big finish was to use Reddit as a quick and easy source of both traffic and a voting booth. It turns out that Reddit is deeply unpopular which I was not expecting. Nevertheless, you guys rallied on anyway and so I am going to award prizes here anyway. Not the original prizes but good ones nevertheless. This prize recognises the willingness of the writers who took part to jump through some strange hoops and do it all anyway. It is shared Jointly by Neil and Jess who posted a lot of their stuff the Reddit vote. Because the Reddit vote turned out to be something akin to last week’s zoo leavings, and all votes were about the same, I have randomly picked two good posts to make the “winners”. Take a bow you two hard working writers. You deserve it. 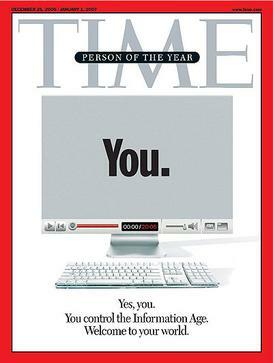 In the grand tradition of Time magazine, the winner of the competition is you. We are all the richer for the great writing that has been put forward during this competition and everyone who took part is a step closer to building an author platform. Which posts would you pick as the winners? Tell us in the comments. Previous PostI was destined to save the world but I oversleptNext PostNathan McGrath: spam or fan?